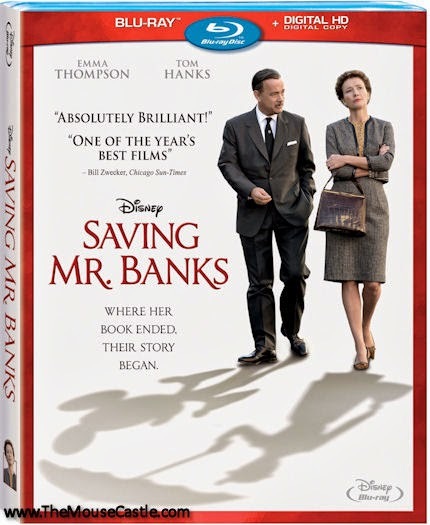 I finally caught up on my Blu-rays this week, giving another look at Saving Mr. Banks (which I really like) and Frozen (which I really don't). These opinions are pretty consistent with my first impressions a few months ago, although I must say my opinion of Frozen may have downgraded a bit. Blame it on "Let it Go" over-saturation. If I never hear that screechy, hyper-hyped, incessantly played song again, I will die a happy man. I realize disliking Frozen in the wake of its Oscar-winning-financial-juggernaut-do-you-wanna-build-a-snowman existence to many is akin to hating puppies and Disneyland. I do not hate puppies or Disneyland. But, I have grown weary of a film that still feels more manufactured than created, more a triumph of marketing than of storytelling. It was a movie that was first teased by showcasing two comical sidekicks without once mentioning that there were (gasp!) princesses involved (Disney took a similar approach when it first advertised Tangled). This hesitance to embrace Frozen’s fairy tale roots always struck me as disingenuous, as if Disney didn't have the confidence to stick by the story it created, a story strongly in keeping with Disney’s animation legacy. For me, everything went downhill from there when the story did prove to be clunky and the songs mediocre. The only highlight was a slow but spunky snowman gifted with the best lines in the film (thank you, Josh Gad, for nailing Olaf’s character with your charming voice work). And yes, I’ll concede that the animation is quite lovely, so I guess that leaves me with no option but to watch Frozen with the sound turned down so I don’t have to hear that song. To its credit, the Frozen Blu-ray does have the Oscar-nominated Mickey Mouse short Get a Horse, which is both a delightful tribute to Mickey’s black and white origins and a playful tweak of modern CG animation. 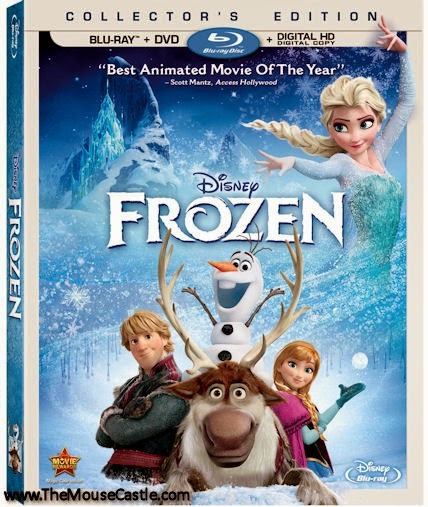 Also good fun is the Blu-ray’s musical “Making of Frozen” production number with Gad, Kristen Bell and Jonathan Groff—make sure you watch that one all the way to the end. Disney history buffs will find “D’Frosted: Disney’s Journey From Hans Christian Andersen to Frozen” a pleasure as well for Alice Davis’s wonderful recollections of her late husband, Disney animator and Imagineer Marc Davis (by the way, Happy Birthday this week, Alice!). Meanwhile, I don’t think Saving Mr. Banks gets the credit it deserves for being the movie it is, a glossy, sentimental confection high on style, even if it is low on substance and factual accuracy. This is not a documentary about the making of Mary Poppins, so don’t ask it to be. It’s a very sweet and sincere fictionalization of what happened when two creative forces of nature, P.L. Travers (Emma Thompson) and Walt Disney (Tom Hanks) collided. Thompson shines as the persnickety Travers, who would rather die than have her precious children’s books given the Disney treatment. Tom Hanks never fully embodies the character of Walt, but he is charming and, well, no one plays Tom Hanks with a mustache better than Tom Hanks. Also strong in Saving Mr. Banks are Colin Farrell as Travers’ charismatic alcoholic father and Paul Giamatti as Travers’ good-natured driver. Best among the Blu-ray bonus features is “The Walt Disney Studios: From Poppins to the Present,” a stroll through the studio lot with Saving Mr. Banks director John Lee Hancock and songwriter Richard Sherman waxing sentimental about the Mary Poppins era at Disney. Ilike your analysis, and your attitude. Thanks for the insights! Thanks, s. I'm glad you enjoyed it.